The Extech AN100 and the AN200 are ideal for HVAC installation, repair, diagnostics, and optimization. 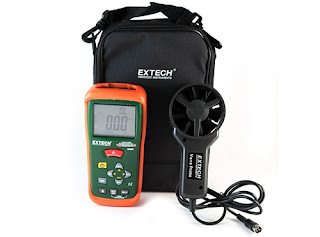 The Extech AN100 and AN200 feature a vane sensor with 3.9' cable and have the ability to set and store 8 area dimensions. The Extech AN200 also features a built-in non-contact IR Thermometer, ideal for measuring surface temperatures in areas that may be to hard to reach. Completer with vane sensor with 3.9 ft. ( 120cm) cable, 9V battery, protective rubber holster, and carrying case.